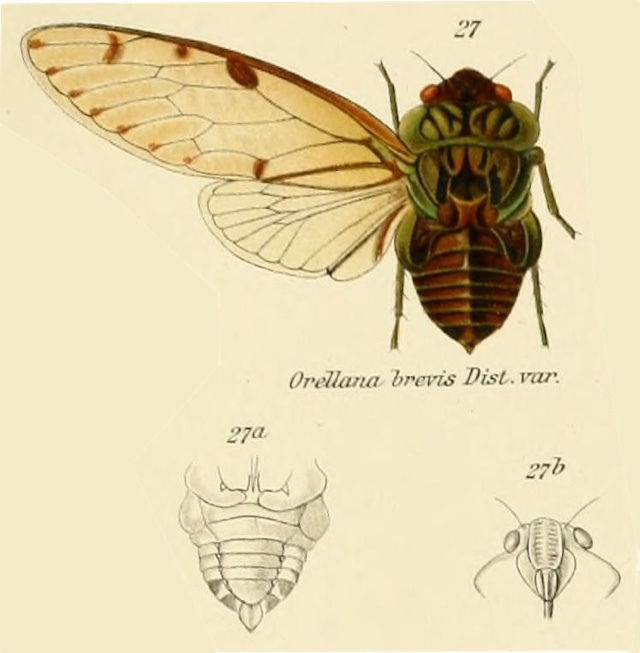 Zammara brevis (Distant, 1905) is a cicada found in Columbia. It was formerly known as Orellana brevis, as you can see from the image below. The Zammara and Orellana genera are very similar — both belong to the tribe Zammarini, both share pronounced pronotal collars and often green coloring. The image says Orellana brevis, but the newest name of this cicada is Zammara brevis. Characters. — Head (including eyes) about as wide as base of mesonotum, ocelli farther removed from eyes than from each other, eyes prominent but scarcely projecting beyond the anterior pronotal angles, vertex strongly depressed before base of front; face longer than broad, narrowly sulcate; pronotum shorter than mesonotum, the lateral margins angularly ampliate; mesonotum about as long as head and pronotum together; metanotum exposed; abdomen short; tympanal coverings outwardly complete, the orifices very widely exposed internally; opercula short, oblique; rostrum reaching or slightly passing the posterior coxae; tegmina usually three times as long as broad, apical areas eight; wings with six apical areas.